I’ve talked about Canva many times before. I truly believe it is a necessary tool to utilize for your blog or business, especially if you don’t have the time, money, or patience to learn PhotoShop. 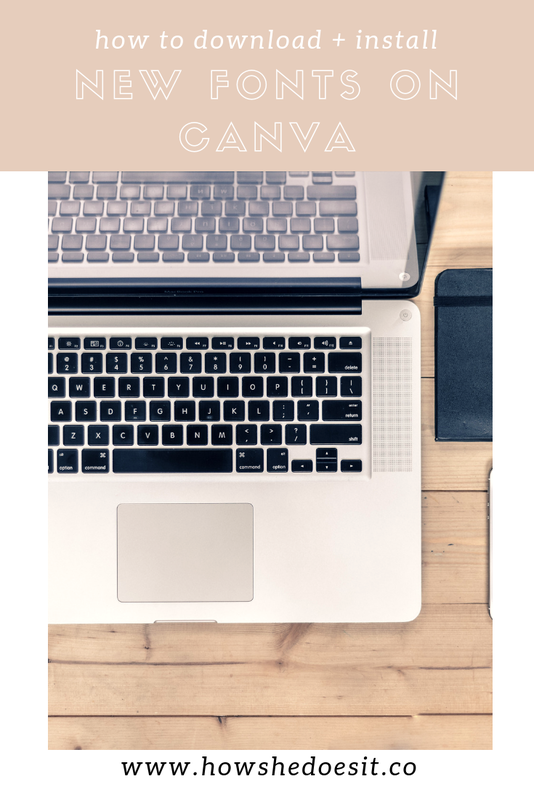 Canva is so easy to navigate, and they offer thousands of pre-designed templates that you can customize to kick your website up a notch. If you are feeling creative, you can create your own graphics from scratch and use their endless catalogue of design elements to create some beautiful designs. This post is not sponsored in any way; I simply just love this tool and want to recommend it to anyone and everyone running a business or a blog. Today I have a new tutorial for you about how to install and upload free fonts to take your designs to the next level. It is SO simple to do this on Canva and takes just a few minutes. The crucial components to this process are the fonts. Finding free fonts for personal/commercial use can be a bit tricky sometimes, but my favorite resource I’ve found so far is this one from Blog Pixie. I use those fonts for pretty much every single design I create in Canva. I’ve added a board to my Pinterest with a collection of resources for other great free fonts you can incorporate into your graphics, but Blog Pixie’s fonts are a great place to start. I hope you find this quick tutorial helpful for your designs — if you have any questions don’t hesitate to reach out!